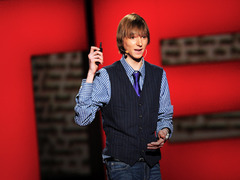 Taylor Wilson: Yup, I built a nuclear fusion reactor Wilson first received attention at the age of 14, after building a nuclear fusion reactor he’d dreamed up in his parents’ garage. He spoke at TED2012 about that experience, and he’s back this year at TED2013 to talk about a new project. Wilson has invented Small Modular Fission Reactors. These reactors are small, meaning that they can be built in factories and shipped wherever they need to go. They are installed three meters underground — making them far safer from a counterterrorism standpoint than something aboveground. And these are molten salt reactors, which means that they have the potential to run on the waste from old nuclear weapons — making the wide distribution of this technology a potential way to secure the material from weapon stockpiles. As Wilson explains, one of the problems with traditional nuclear power plants is that they only run for 18 months before needing refueling. Small Modular Fission Reactors, on the other hand, will run for about 30 years before they run out of juice. This means that they will be a closed system while they are in use, making them safer. And after the 30-year mark, these reactors can be sealed up and discarded. As Wilson explains, because the material in Small Modular Fission Reactors is already molten, meltdowns won’t be a factor. And in the case of a disaster, the core can be drained to a tank underneath, stopping the reaction. Wilson is excited about the potential of Small Modular Fission Reactors because they could provide carbon-free electricity for homes and businesses, helping to combat climate change. And because they are produced in factories, for cheap, they may be a way to bring power to the developing world. Wilson excitedly tells TED curator Chris Anderson that he hopes to have Small Modular Fission Reactors to market in five years. But Wilson sees other potential for these reactors — to fuel scientific exploration in other areas, perhaps even space. Small modular reactors is a new excellent approach for the new generation of nuclear power reactors. The units will be flexible enough to produce descentralized NH3 for fuel and fertilizer, process heat and electrical power in a completely sealed unit that can be removed after its operational life with no radioactive footprint on the environment. “Invented small modular reactors” Umm no. Not even close. There are numerous designs from pressure water reactors to liquid metal reactors. Two companies are currently undergoing licensing review for SMRs (NuScale, B&W/mPower) with the NRC. Low and behold many of the claims in this design are the same claims made for the other reactors. Also note that a small molten salt reactor was operational at Los Alamos for years. Not to mention, many of the design advantages put forth are the same advantages put forth for the large MW molten slat designs. Good on the kid for having some ambition but what has been presented design wise is not revolutionary. This is a brilliant approach to becoming energy independant. It is green and very plentiful. Small reactors to the third world are a non-starter. Al-Quaida will take an angle-grinder to it soon as lift it out the packing crate. Its near impossible to create an effective nuclear weapon without very high-tech. I was thinking more of the dirty-bomb possibility. True, Thorium is abundant in the Earth’s crust, but try telling that to the anti-terrorist squad as they defuse a radioactive lump left in a public place. Taylor ROCKS—Nuclear ENERGY is our world’s FUTURE! Dude built a nuclear fusion reactor, he was 14!